The hybrid practice of the Raqs Media Collective is as expressively poetic as it is rigorously analytical. A Raqs work, like a move in an ongoing game of chess that anyone can enjoy, can be strikingly simple in its appearance and execution and yet be driven by an immense complexity of motives. Raqs follows its self-declared imperative of ‘kinetic contemplation’ to produce a trajectory that is restless in terms of the forms and methods that it deploys even as it achieves a consistency of speculative procedures. Typically, a work by the Raqs Media Collective pursues the textured experience of time, weighs the odds of staying one’s course in turbulent cities and collates its own layered commentary of the text of the world. The collective is equally comfortable with ambitious installations and with works in minor media, and their work may be found as easily in large museum galleries as in the pages of little magazines or on a website. They enjoy playing a plurality of roles, often appearing as artists, occasionally as curators, sometimes as philosophical agent provocateurs. 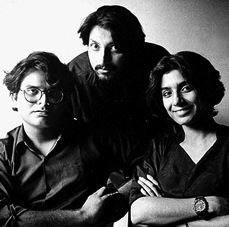 They have curated exhibitions, edited books, staged events, collaborated with architects, computer programmers, writers and theatre directors, and have founded processes that have left deep impacts on contemporary culture in India. Raqs’s works have a definite political signature, but not one made up of postures and slogans. In ‘Fragments from a Communist Latento’ Raqs annotates familiar political postulates with their own nuanced gloss to construct a playful and necessary update of the radical agenda. The Raqs Media Collective was founded in 1992 in Delhi by Jeebesh Bagchi, Monica Narula and Shuddhabrata Sengupta. Select group participations include Documenta 11, Venice Biennale – ‘The Structure of Survival’ (2003), Istanbul, Taipei and Sydney Biennales, ‘Indian Highway’ at the Serpentine Gallery, London, and ‘The Art of Participation’ at SFMOMA, San Francisco. Raqs has had solo exhibitions at The Tate Britain and Frith Street Gallery, London, IKON, Birmingham, The Baltic, Newcastle, Museum for Communciation, Frankfurt, Nature Morte, New Delhi, Museum of Modern Art, Warsaw, and eflux Gallery, New York, amongst other places. In 2000 Raqs Media Collective co-initiated the Sarai Programme at the Centre for the Study of Developing Societies in Delhi and in 2008 they curated ‘The Rest of Now’ for the eighth edition of Manifesta – the European Biennale of Contemporary Art. The members of Raqs live and work in Delhi, India.